Omni Completion in Vim | Software ahoy! 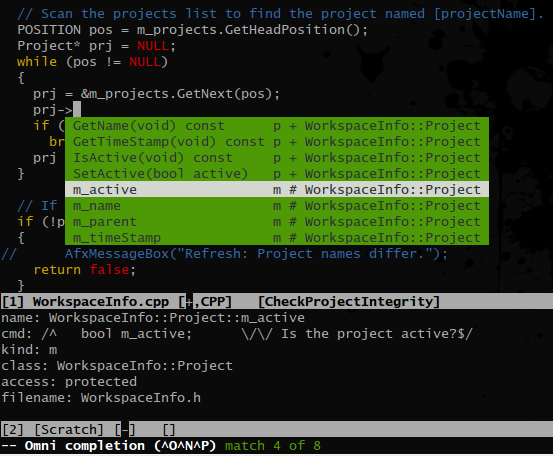 Vim 7 onwards, we have Omni Complete feature. This feature is similar to IntelliSense in Visual Studio or other IDEs. It can show a pop up menu displaying the structure, class or scope context. Here is a screenshot of Omni Complete displaying the class scope in CCCC code base . As you can see, it can show all methods and variables including its original context like type, prototype (in case of method), documentation (if documented), private/protected/public, file defined in etc. Install all 4 by whatever means (apt-get, yum, build from source). OmniCppComplete and SuperTab are Vim scripts, detailed installation steps are given in the respective links. GNU has a version of ctags. But what we need is exuberant ctags which is different from GNU ctags. Most popular Linux distros bundle GNU ctags, but exuberant ctags should be available from the repository. Vim is an excellent editor, but does not understand C/C++ natively. This is where ctags comes in to the picture. Ctags will generate a “tags” file which is like an index of the project source code. This tags file is used by Vim and OmniCppComplete script to provide contextual data in a pop-up menu. To build a ctags tags file, give the command from the top directory of the project. This can be done from any subdirectory too (for even more focused tags file). Run vim from the same directory. By default, Vim will search for tags file beginning from current directory to all parent directories. First tags file found will be used. For better usability of OmniCppComplete, put these in your .vimrc file. The default key mapping for invoking Omni Completion is C-X C-O. SuperTab plugin can help us invoke Omni Complete when we press TAB key. Also in the default color scheme, vim pop-up menu is in pink. Let’s change that to green. As we edit code, newer types get defined, but vim continues to use the same tags file. So we need to regularly update our tags file. We can add a shortcut map (say pressing F4) in our .vimrc for the same. execute ":!ctags -R --languages=C++ --c++-kinds=+p --fields=+iaS --extra=+q ./"
Thanks for the guide. This proved all I needed to get started with useful auto-completion in vim. for big projects also may use ‘-L filename’ option for ctags (see man ctags) to list all external headers.